The North Ridge of Mount Washington is a great alpine rock climb, placing the climber on a dramatic peak with spectacular panoramic views. This one day climb combines a fun approach hike before gaining the sweeping North Ridge of Mount Washington. 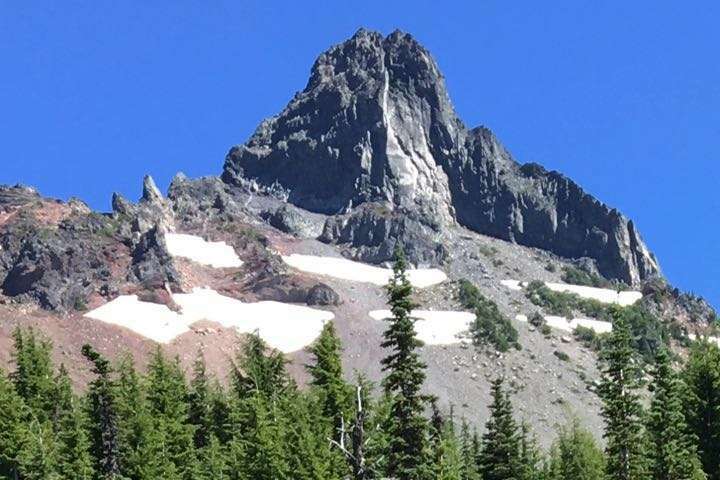 After our steady climb up the ridge we will launch into a couple short pitches of low 5th class rock before finding ourselves on one of the more dramatic peaks in the Oregon Cascades. The North Ridge is the perfect climb for those looking to add rock climbing to their repertoire of alpine climbing skills. We are able to offer this summit day on Monday through Thursday only, because of limitations on all commercial permits in the Deschutes-Willamette National Forest. A great introductory alpine rock climb with, possibly the best view of all the Oregon Cascades. The North Ridge has solid climbing, a memorable summit and a steep rappel. Combine that with a beautiful approach hike on the Pacific Crest Trail, and this is an alpine summit that you want to add to your tick-list. The Monkey Face is an awesome summit, and a great place to build more climbing skills.